Museum Volkenkunde, Leiden (National Museum of Ethnology) and Wereldmuseum, Rotterdam in their museum shops. If you don't have a Paypal account, email me at the above link and I will send you a Paypal invoice. You may pay through them with your credit card. This is good for international orders. 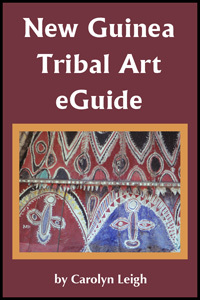 Check out our Publication book list including New Guinea Tribal Art eGuide - quick info about New Guinea art and art areas with links to more information. Buy now from Amazon or from the Apple Store through iTunes for all your electronic book readers - only $3.99. 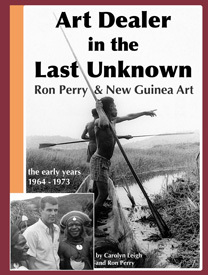 "This large-format paperback is packed with field photographs and notes made by veteran tribal art dealer Ron Perry and compiled with his wife and companion on many adventures, Carolyn Leigh .... Perry traveled to hundreds of villages and collected both traditional and transitional art in huge quantities, some of it of museum quality and some hitherto unknown to the Western art world. 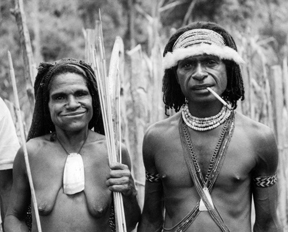 "As the authors rightly point out, many books and papers have been produced on tribal art and collections ... but seldom have the field collectors written about their own experiences. This book, plus the second volume dealing with the ten years following independence and a third covering their time together collecting on both sides of the island, begins to fill this gap in the literature." "... the book is enlivened with hundreds of black and white photographs with informative captions and all sorts of ephemera ... Ron has hoarded. And of course, by his memories of people - both black and white - and the occasional outstanding artefact. "It is a book you can either read right through or dip in and out of. 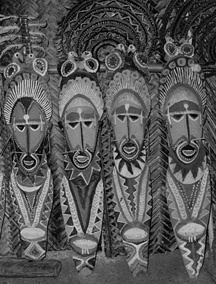 You could just about open it on any page and find an interesting photograph to look at or one of the many text boxes to investigate on the side of the page - snippets of information including newspaper reports of the times and notes on well know ex-pat personalities and tribal customs." Check out our gallery and wholesale info. Photographs, text and maps copyright © Carolyn Leigh, 1996-2013. All rights reserved.